Greetings from Maizi World – I hope you’re all enjoying the stormy but mostly pleasant start to June. I’ve been continuing my vigilant SquirrelWatch™ (now that could be a great TV show) across my garden. None shall pass. I also sometimes let my humans Steve and Ann in so they can water the flowers and tend to the vegetable patch. In between my SquirrelWatch™ duties, blue-sky thinking and my all-important food and sleep breaks I’ve also been regularly posting on my Twitter account @MaiziMutt and on my human’s LinkedIn profiles. Bet you didn’t know that I can find my way around LinkedIn too. 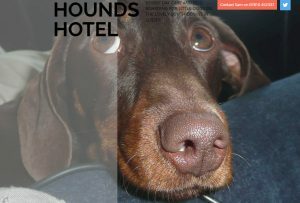 Recently a new Twitter follower caught my eye – The Hounds Hotel. Hounds Hotel, unsurprisingly is a hotel for dogs (I’m sure they made a film about that, in fact I’m sure they made 2) set in the green and pleasant countryside of the South Downs, West Sussex area offering ‘big fun for little dogs’. I’m not sure if I’d pass their ‘Hounds Hotel requirements’ as I’m more of a medium-sized canine but I hope I do as their doggy customer service looks exceptional. If you’ve been following me on Twitter or reading my other woofposts you’ll know that I’m a big champion of customer service for humans. The Hounds Hotel is a real game changer by offering excellent customer service for dogs, and indirectly to their humans too. Hounds Hotel is run by Sam who clearly has a genuine passion for dogs and their welfare so you just know that it’s going to be a brilliant experience for all her guests. And this is backed up by the videos and photos on the site and the Twitter account. Goes the extra mile – metaphorically and literally all over the Downs! Thinks long term – I don’t know for certain but would hazard a guess that Sam gets a lot of repeat business and word-of-mouth referrals, her guests look so happy in the photos and videos.